Prague’s TEDx enthusiasts and TEDxUNYP supporters had to wait a little longer for this year’s event, but it was worth the wait! Previously held in November of each year, the university TEDx event has now moved to its new mid-March slot for 2019 and all future events. 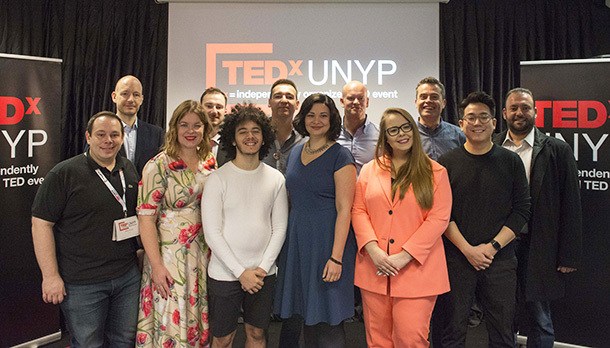 TEDxUNYP 2019 did not disappoint, with nine new speakers – including chemists, poets, politicians, students, designers and millionaires – delivering timely topics that inspire thought and imagination. TEDxUNYP is one of the only TEDx events in the Czech Republic that delivers its program exclusively in English. In addition to students of the University of New York in Prague, the event was also attended by students from other universities, TEDx fans, and the local community. In addition, this year’s TEDxUNYP introduced a new format with a single ticket covering the entire event and an intermission reception hosted by Opus Café. For this year’s event, we were lucky enough to welcome some serious professional speakers and personalities such as the award-winning chemist and well-known Czech personality Michael Londesborough; Rafael Badziag, a best-selling and award-winning author and an experienced TEDx speaker; Linda Štucbartová, a journalist and women’s empowerment leader; and Jakub Lepš, Deputy Mayor of Prague 11 and Party Leader for TOP 09. A full listing of the speakers and their topics can be found at www.tedxunyp.cz. The event was moderated by Mitch Leffer, UNYP Student and part-time comedian. Mitch closed the event and announced that the next TEDxUNYP will have a new, larger venue for 2020 pending license renewal, and the tentative date of March 28th, 2020.